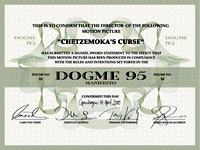 Only the second American Dogme 95 movie, Chetzemoka’s Curse is about a young, twenty-something woman, Maya (Maya Berthoud), who is haunted by the memory of her first love and her subsequent betrayal. She still feels the pain, works to exorcise it as she wiles away her life as a maid in a small town hotel. But her road to health seems to include passing the bad karma along. She encourages an older married man to run off with her and betray his wife and kids. Betrayal is in the air. Even an itinerant street musician sings about his infidelity. Bottom line, he says, is that he betrayed himself.